This medication contains 2 drugs (hydralazine and isosorbide dinitrate) and is used with other medications to treat heart failure. Both drugs are known as vasodilators. They work by relaxing and widening blood vessels so blood can flow more easily to the heart. The dosage is based on your medical condition and response to treatment. Your doctor may start you at a low dose and gradually increase your dose. Follow your doctor's instructions carefully. What conditions does Bidil treat? Headache is often a sign that this medication is working. Your doctor may recommend treating headaches with an over-the-counter pain reliever (such as acetaminophen). If the headaches continue or become severe, tell your doctor promptly. This medication may rarely cause nerve problems. Tell your doctor promptly if you experience numbness or tingling. Your doctor may recommend a vitamin B6 supplement (pyridoxine). Tell your doctor right away if any of these unlikely but serious side effects occur: severe tiredness, aching/swollen joints, rash on nose and cheeks, swollen glands, signs of kidney problems (such as change in the amount of urine, bloody/pink urine), signs of infection (such as fever, chills, persistent sore throat), easy bruising/bleeding, fainting, fast/irregular/pounding heartbeat. Seek immediate medical attention if this rare but serious side effect occurs: chest/jaw/left arm pain. List Bidil side effects by likelihood and severity. Before taking this medication, tell your doctor or pharmacist if you are allergic to either isosorbide dinitrate or hydralazine; or to similar drugs (such as isosorbide mononitrate, nitroglycerin); or if you have any other allergies. This product may contain inactive ingredients, which can cause allergic reactions or other problems. Talk to your pharmacist for more details. Before using this medication, tell your doctor or pharmacist your medical history, especially of: other heart problems (such as recent heart attack, rheumatic heart disease of the mitral valve), previous stroke, low blood pressure, blood vessel problems, loss of too much body water (dehydration), recent head injury, anemia, kidney problems. Older adults may be more sensitive to the side effects of this drug, especially dizziness and lightheadedness, which could increase the risk of falls. Hydralazine passes into breast milk. It is unknown if isosorbide dinitrate passes into breast milk. Consult your doctor before breast-feeding. What should I know regarding pregnancy, nursing and administering Bidil to children or the elderly? Some products that may interact with this drug include: certain drugs to treat migraine headaches (ergot alkaloids such as ergotamine), drugs to treat erectile dysfunction-ED or pulmonary hypertension (such as sildenafil, tadalafil), MAO inhibitors (isocarboxazid, linezolid, methylene blue, moclobemide, phenelzine, procarbazine, rasagiline, safinamide, selegiline, tranylcypromine), riociguat. Does Bidil interact with other medications? Should I avoid certain foods while taking Bidil? If someone has overdosed and has serious symptoms such as passing out or trouble breathing, call 911. Otherwise, call a poison control center right away. US residents can call their local poison control center at 1-800-222-1222. Canada residents can call a provincial poison control center. Symptoms of overdose may include: slow heartbeat, vision changes, severe nausea/vomiting, sweating, cold/clammy skin, bluish fingers/toes/lips, chest/jaw/left arm pain. Laboratory and/or medical tests (such as complete blood count, blood pressure monitoring) should be performed periodically to monitor your progress or check for side effects. Consult your doctor for more details. Lifestyle changes such as exercise and dietary changes may help this drug work better. Talk to your doctor or pharmacist about lifestyle changes that might benefit you. 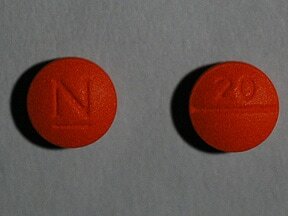 This medicine is a orange, round, scored, film-coated, tablet imprinted with "20" and "N". Are you considering switching to Bidil? How long have you been taking Bidil?